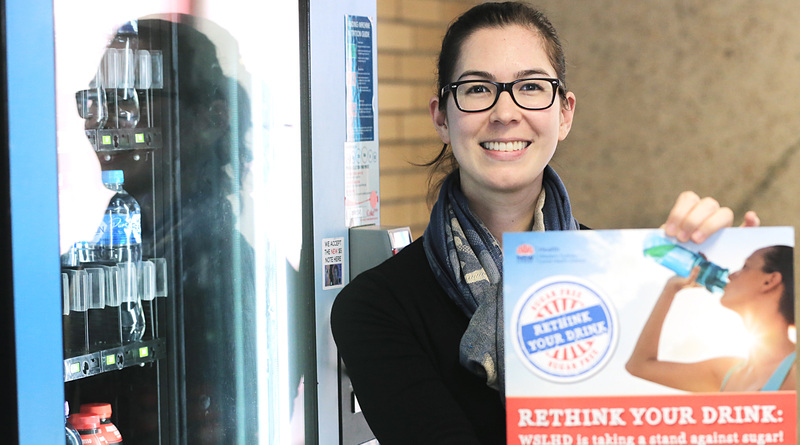 Westmead Hospital dentist Michelle McNab supports the Rethink your Drink campaign. We know giving up soft drink is good for your waistline – but what about your teeth? Staff at Westmead Hospital’s Centre for Oral Health have been big supporters of the hospital’s Rethink Your Drink trial because they know soft drink is a big cause of tooth decay. Dentist Michelle McNab said sugar sweetened beverages, like soft drinks, can be damaging to our oral health. “Sugar sweetened beverages are high in sugar, which feeds bacteria on the teeth and causes tooth decay,” she said. “They are also acidic, which can lead to erosion of enamel (the protective outer surface of the teeth) and can result in sensitivity. Michelle said preventing tooth decay was critical – and swapping soft drink for water can help. “We want everyone to make water their drink of choice,” she said. “It’s sugar-free, calorie-free and can help protect your teeth. The trial has been a huge talking point with staff, patients and visitors – some people didn’t like it, some people loved it; but mostly, people understood the hospital’s need to lead by example. Westmead Hospital management, along with Western Sydney Local Health District’s Population Health team, Coca Cola Amatil and Zouki, are now reviewing all feedback received during the trial. We will keep staff, patients and visitors informed about the next steps. We still want to hear from you! Email WSLHD-CentreforPopulationHealth@health.nsw.gov.au with your thoughts.